She was born in the year of our Lord 1818 and departed this life on the 30th day of July 1833. Aged fifteen years, 4 mo’s. and 18 d’s. 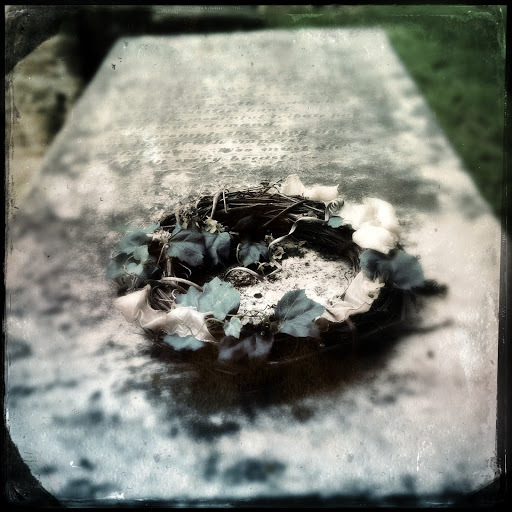 Elizabeth’s grave in Grove Street Cemetery is memorable for two reasons: she the earliest known burial in the cemetery and according to folklore, the teenaged boarding school student was “scared to death” after a foreboding message appeared on her bedroom wall in 1833. No one is sure how much of the tale is true, but the account has been passed down through generations via books, historical reenactments, and most likely whenever someone brings up Grove Street Cemetery in conversation. I found two articles in the local paper about the history of the cemetery, one from 1951 and the other 1975. The details are basically the same: Elizabeth, a 15-year-old student was recovering from measles when she left her room for dinner. 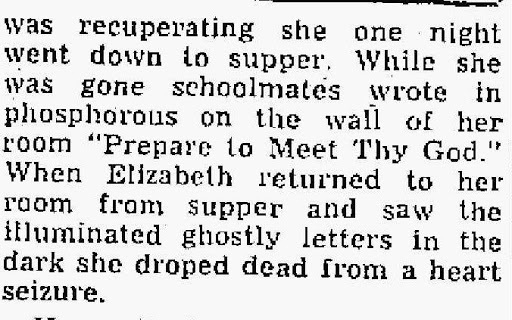 While she was out some of the other girls wrote “Prepare to Meet Thy God” on her wall in phosphorous. When Elizabeth returned the fright from the glowing warning prompted a fatal heart attack. 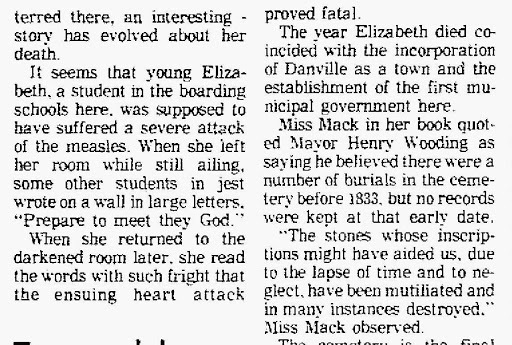 I’m not sure which female academy Elizabeth attended because there were at least two in Danville around the time of her death. I think it would be interesting to know what happened to the girls who were involved in the prank. I’m sure knowing that they played a role in Elizabeth’s demise impacted them in some way. I wonder if the girls were her friends and thought they were playing a lighthearted joke or if they were purposely being cruel and ended up killing their target. 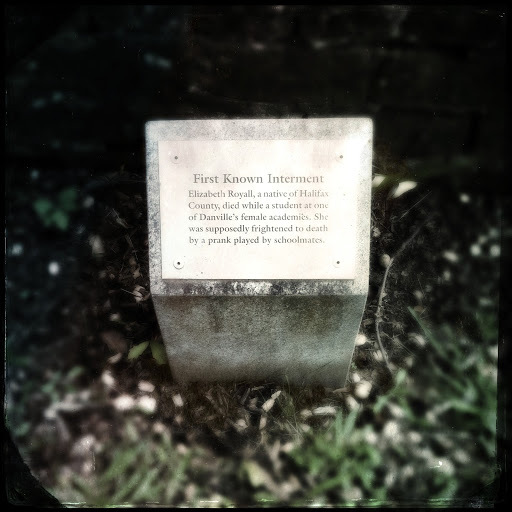 There is no record of any other member of the Royall family buried in Grove Street. The information that I found suggested that between 1841 and 1850 Elizabeth’s parents and siblings moved to Missouri. 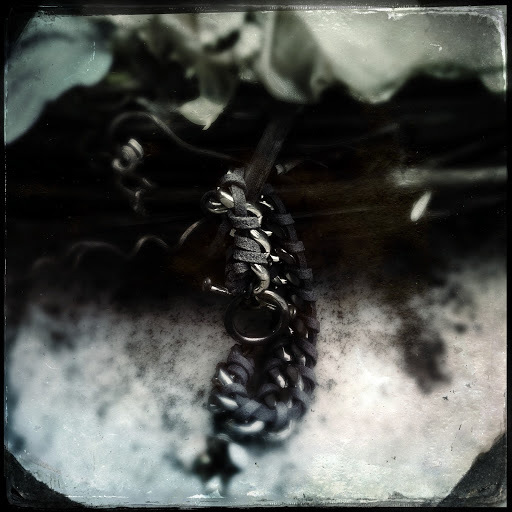 Elizabeth might have been left behind in the small Danville burial ground, but she isn’t likely to be forgotten anytime soon as locals continue to visit her grave and leave offerings. How unusual that such a young person should suffer a heart attack. Makes me wonder if maybe her heart had been been weak? Really interesting post! My husband and I visited her grave on Sunday. We saw this wreath hanging in the bush beside her grave but didn't know it was from hers!